In the comics, Negan kills Glenn! But he doesn’t just kill him… He beats Glenn to death with Lucille — in front of Maggie and Rick and the rest of the gang! It happened in issue #100, and was easily the most brutal and shocking death of the series to date. Morgan can currently be seen on THE GOOD WIFE, and next spring will play Thomas Wayne in Batman v Superman: Dawn of Justice. 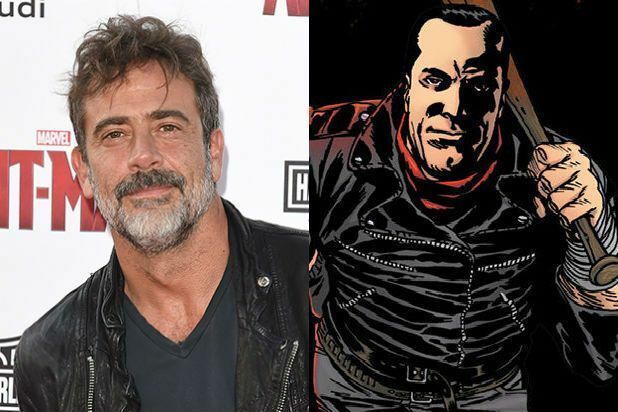 This entry was posted in Actors/Actresses, Casting, Comic Book Adaptations, Cult TV, Horror, Weapons and tagged Jeffrey Dean Morgan, Negan, The Walking Dead. Bookmark the permalink.